While I don't think this movie is better than the prior film, it's so inline with the original movie, and such a natural outgrowth of that story, that this is one of the most logical and most natural sequels I can ever remember seeing. And so good on Stallone, who doesn't just return as the writer, he got to direct this installment. 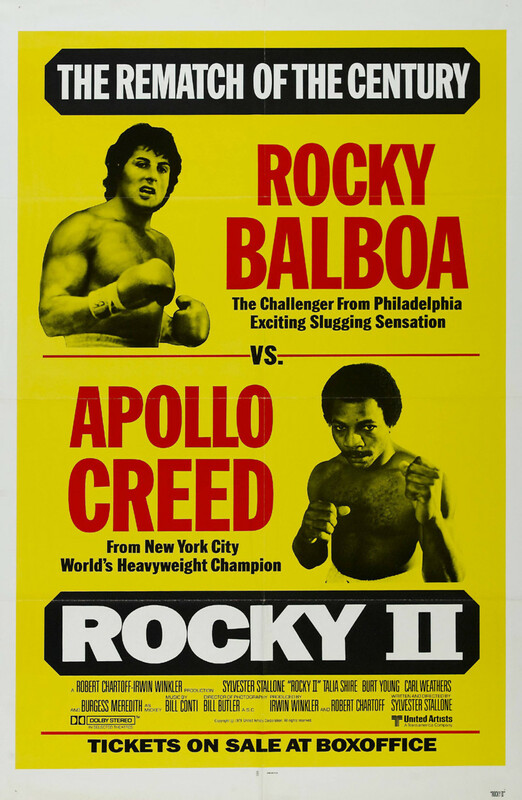 Oh, yeah, if you missed it, I've never seen Rocky or Rocky II (1979) before, so this is all new to me. Sort of. 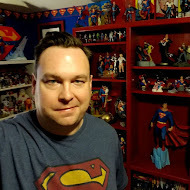 I'd picked up on the basics of the plots of the first two movies, seen the third and fourth, and none of the rest in the series. I'm glad the dog didn't disappear. That dog is hilarious. It was probably Stuart who schooled me on how these movies followed Stallone's own struggles, trying to adapt after a brush with stardom and failure to monetize that early success, while also going nuts - not familiar with money or how all this works. But Rocky remains tremendously sympathetic. He's all heart, and even in the face of Creed's understandable jawing off, the anger that builds in boxers before a fight, Rocky is unable to match that bravado (no wonder he was terrible at collections). I won't rehash the movie beat-by-beat. I'm not sure the "Adrian is in the hospital" bit wasn't a little belabored. But it does drive home where the fuel that fires Rocky comes from, and reinforces what we learned about Rocky and Adrian from the first movie - giving it additional weight here. The film also begins to play with some of the hokeyness that overtook the series by the fourth movie. I actually *loved* the training sequence that crescendos with Rocky back on the steps, this time followed by a few dozen kids who joined him on his training run - no longer the unknown. That's a heck of a sequence, and it rightfully earned its place in the pantheon of much imitated and lampooned sequences. I'm just not sure it didn't put some bad ideas in someone's head about Rocky training montages. Unfortunately, next I'll be skipping, like, four Rocky films and jumping straight to Creed. I've been instructed to see Ryan Coogler's film before going to see his Black Panther. Yeah, this is one that has really grown on me over the years as well. Some amazing character stuff that I, again, just wasn't old enough to recognize the first few times. "Win..." DING! -- enter the *amazing* Bill Conti score that expands on the original and what maaay be my favorite training montage of the series. 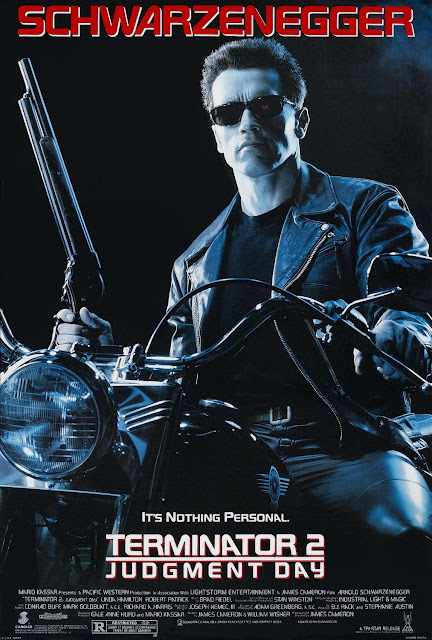 I saw this for the first time in at least 20 years a few years back, and was surprised how good it was. 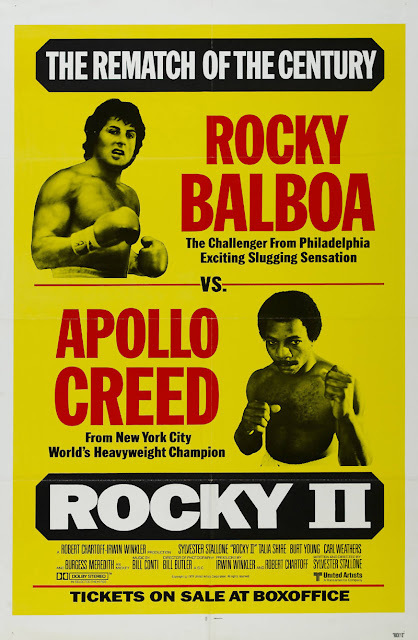 Creed is excellent, but don’t skip Rocky III. It’s very good, although different than the first two. It focuses on how Rocky deals with success, which it turns out can be just as challenging. It’s a common theme in real life fighters. Once you get the belt and millions in the bank, how do you stay hungry? Mr. T is, well, Mr. T, which is a good thing here. You see the beginning of Rocky’s friendship with Apollo, and once again, Carl Weathers is great. I was going to mention watching Creed, which is pretty good. And man, I love me some Rocky IV. Fine piece of American jingoism.